Mahatma Gandhi, the Father of the Nation, considered consumption of alcohol as a major social evil and thus encouraged complete prohibition in India. The Constitution of India in its Directive Principles of State Policy (Article 47) provides that, "The state shall endeavour to bring about prohibition of the use of intoxicating drinks and of drugs which are injurious to health except for medicinal purposes." As alcohol is a subject in the State List under the 7th Schedule of the Constitution, laws governing alcohol and the legal drinking age vary from state to state. Other than Manipur, states like Gujarat, Mizoram, Nagaland, Kerala and union territory of Lakshadweep prohibit consumption of alcohol. In Manipur, Prohibition is enforced in the Imphal East, Imphal West, Thoubal and Bishnupur districts as per 'Manipur Liquor Prohibition Act, 1991', whereas it was removed from the five hill districts with the passing of Manipur Liquor Prohibition (Amendment) Bill, 2002. Prohibition is also the demand of various underground organizations and the women groups. In fact, the law is not imposed on some Scheduled Castes and Scheduled Tribes who are traditional liquor brewers. Hence, locally brewed wine is openly available at places inhabited by them. In spite of Manipur being a 'Dry State', number of liquor users have increased manifold with illicit vendors being run openly at various public places and residential areas. The state agencies including the Excise and the Police departments, instead of enforcing the ban on liquor, directly encourage the sale of intoxicants by allowing many of their personnel to collect bribes from the vendors. It is open secret that illegal liquor vendors serve as sources of side-income for various ranks of the state police. Although police sometimes raid some drinking joints, bootleggers are rarely punished and alcoholics are seldom booked. Ban of liquor in Manipur has always been a herculean task, as it is imbibed with age-old customary practices of various communities in Manipur. At least for traditional ceremonies, many sections of communities residing in the state have to brew liquor. Moreover, questions on human liberty have posed a great challenge in regulating use of alcohol. Although everybody knows the ill-effects of alcohol on health and society, use of same has been rampant in the nook and corner of Manipur. A number of youths have died of alcohol related ailments like the liver cirrhosis, while many young and old citizens of the state have become victims of alcohol addiction. Alcoholism breeds family problems, thereby leading to broken families and fruitless children. Besides compromising the very health of the users, alcohol damages the health of the society as well. Those fallen on liquor lose direction in life and are forced to undertake anti-social activities only to satisfy their immediate desires for the intoxicant. The reality at some places within Imphal city is that the bootlegging shops near residential areas find a hectic schedule to serve the regular drinkers. Pre-dawn drinkers make the bootlegging shops as their morning-walking destination. 'Quick-5, 'Road-Pack' etc. are usual slangs associated with heavy and regular alcoholics. Availability of wine at residential areas increases frequency of consumption and flexibility of payments, thereby mounting the effects on health and economy of the users. Although alcohol is harmful in all spheres, human society anywhere at any point of time failed to control the menace of alcoholism due to various factors. Origin of the infamous Meira Paibi movement in Manipur during the 1980s may be attributed to the widespread use of alcohol by the adults of the society. Women, who felt the sufferings in the family when their husbands were addicted to alcohol, spontaneously came out to the streets to serve as vigilance against sale and use of liquor. In the beginning, women meira paibi groups (also called Nishabandh) in each and every locality effectively banned the liquor business in their localities. Acting even up to the dead of night, meira paibis caught and punished alcoholics with their own ways of disciplining. Later on, with the increasing human rights violations perpetrated by the security forces in Manipur, the role of meira paibis began to cover wider issues of the society. In the recent past, banned underground organizations also resorted to punish the sellers and the users of liquor in their own way. Thrashing and even gunning down of defiant businessmen and alcoholics were reported frequently. Keeping aside the legality or otherwise of the armed groups, underground organizations served as an effective deterrent towards anti-social activities like alcoholism, drug use, bribery and favouritism. 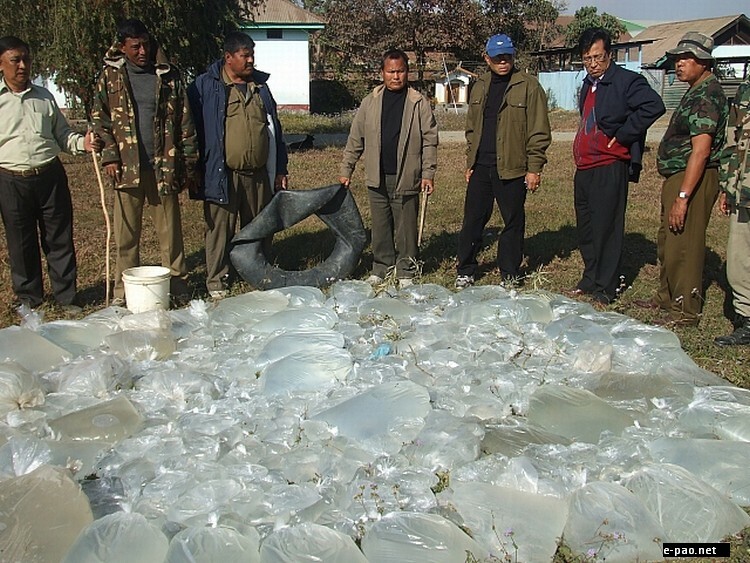 Organisations such as AMADA (from 2005) and CADA (from 2007) have also been checking the menace of alcoholism in the nook and corner of Manipur valley. However, despite the social control measures initiated by various civil bodies, sale and use of alcohols in Manipur have considerably increased. When the government agencies have completely failed to control the burgeoning liquor business in Manipur, the efforts of social organizations in enforcing the liquor ban have also reduced to a farce. Keeping Manipur under the dry state status, in the midst of widespread and uncontrolled use of liquor, has produced a number of challenges in social development. Most security persons are earning their side-income from the 'illegal-but-open' sale of liquor everywhere in Manipur. Quality of the available brands (both local and foreign) of liquor has also deteriorated to a great extent, causing severe health problems besides the sporadic crimes related to intoxicants. If the situation is to continue, then there is no reason for the state being under 'Dry Status'. Instead, regulated sale and use may be proposed for the betterment of the society. However, lifting of prohibition should not be considered from the economic point of view, as the issue arises due to inability to enforce the prohibition by the state agencies. This article was posted on August 30, 2014.